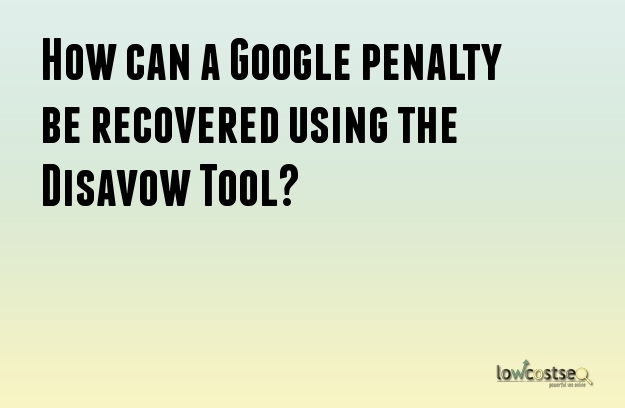 How can a Google penalty be recovered using the Disavow Tool? Link building is an important tool in any search engine optimization effort. However, so-called "black-hat" SEO link building practices have no place in a professional's search engine marketing toolkit. Using excessive or “spammy” back links to acquire PageRank for a web page can incur a Google penalty. The Google algorithms that are made to punish excessive or spammy link building are collectively known as "Penguin”. “Penguin” was first implemented in April of 2012. Subsequently, many sites which had utilized spam techniques for building back links were hit with a penalty, which drastically reduced their PageRank and search engine result positions. Examples of excessive back linking include infamous techniques such as using automated bots to discover public comment areas on blogs and forums and auto-posting a link back to the specified site, excessive article submissions with too many back links, and mass submissions to low-quality web directories. Many webmasters who had contracted out their SEO were taken aback to discover that their back link profile, which consisted of well over 20,000 “spammy” back links, were devastated by the Google Penguin updates. Fortunately, Google released a back link disavow tool for websites to recover from this penalty by informing Google to disregard the back links that the webmaster specifies. This program, known simply as the "Disavow Links" tool, is a part of the broader range of tools offered by Google under the aegis of Google Webmaster Tools. So how do you use the disavow tool? The first step is to register for a Google account and sign up for Webmaster Tools. Upon signing up and confirming the ownership of the website from which you want to disavow links, click on "Search Traffic" on the main dashboard. Underneath "Who-links-the-most," click the "More" button. Click the "Download-more-sample-links" button to download a file containing all the links pointing to your site. Now, go to the disavow links tool at https://www.google.com/webmasters/tools/disavow-links-main. Select the website on which you want to disavow back links and click the "Disavow links" button. You will then be prompted to upload a file. Naturally, this file is the one you created earlier; locate it and upload it. Google will then begin to disavow the links you specified in the uploaded file. Depending on the scale of the problem, this process could take some time and possibly up to a few weeks as it takes time for Google to recrawl. According to Google, it is not good enough to just disavow links. You should also attempt to remove them from the sites as best as you can. The ideal approach would be to manually fix this situation first by contacting the site’s webmasters to request for the removal of your links. It is imperative to understand the difference between an algorithmic and a manual penalty. In the case of a manual penalty, you may be provided with some examples of the bad links that you are being penalized for. It should be noted that the mentioned links may not be the source of the problem, but just examples of a bad link. A teacher would only return what he/she confiscated if the student corrected his/her ways and promised not to do it again. It would usually end with “I promise not to do it again”, which is probably what Google is looking for as well. Putting yourself in Google’s shoes may just help you to submit a compelling case in order to recover your website fast. Can removing a Google Penalty make my site stronger? Here is an example of a client’s question to us? My site was on page 1 for many keywords for several years then it got penalized as we had over used some keywords. Even after removing the keywords the issue is still there and we have not recovered our rankings till now. They intermittently keep hitting page 1 then back to page 6 so we are not sure how to correct this problem? We had to go over the client’s site in depth to find out the core reason for the problem behind the penalty. The site was excellent in terms of content however we noted a problem with keyword stuffing. We also noted that he had far less links build on his site then his competitors and that too is something that needs to be addressed right away. We checked everything else from page loading times to server configuration too but everything was perfectly in order. 1. Remove all of the keyword stuffing on your website. We understand it might take a long while to do this but it has to be done in order to remove the Google Penalty. After your site has been cleaned then the quality content will enhance the site’s value once again and bring an end to the Google Penalty. 2. Start an ongoing link building campaign immediately. Link building is one way to build some credibility for the website and some high quality links can give a lift to the website and Google might be forced to revise or rethink about the penalty. 3. Have you checked for any errors/alerts/warnings on your Webmaster Tools account that Google has provided. After cleaning the site, make sure you submit a new sitemap so that Google sees any new changes that you have implemented on the site in terms of new content or pages. 4. Add new high quality content on main areas of your website and also add more unique articles to the blog section if any. This move will send positive vibes to Google and enhance your chances of getting rid of the penalty quicker. 5. Make sure you have a Pay Per Click campaign running so that during a bad month of rankings you will still get plenty of leads or clients contacting you. 6. Patience is the best virtue to have in SEO. If you follow and implement everything that we have mentioned above then you will be in a great position to succeed and in doing so create an even stronger site.